Fine, thinning hair is very fragile and prone to breakage. They are just about hanging in the follicles and thus you need to provide them extra nourishment and care. Of course internal nourishment is vital, you also need top class external care to preserve and fortify your thinning locks. Jojoba oil, in my opinion, is one of the best treatment for fine, thinning hair type. Jojoba oil, pronounced as hohoba (it’s a Spanish word ), is extracted from seeds of Jojoba plant, an arid shrub which is native to Southern California, Arizona and Mexico. Jojoba oil isn’t actually an oil – it’s an ester (this means it will be less greasy). It’s light nature, high spreadability, and dry feeling makes it ideal for moisturising in a kind of ‘oil free’ way. And this unique quality is essential to treat fine, thinning hair, which are delicate and weak. This amazing oil is chemically very similar to the sebum (natural oils) of our skin. As a result, it sinks effortlessly into our scalp and hair follicles – but it doesn’t block the follicles. In fact it helps loosen stubborn sebum and debris which could be affecting hair health and also new hair growth. This is one reason it is said that jojoba oil allows our skin to ‘breathe’. Besides, the essential fatty acids in jojoba oil work wonders for dry scalp and itchiness caused due to hard water or harsh chemicals in shampoo. 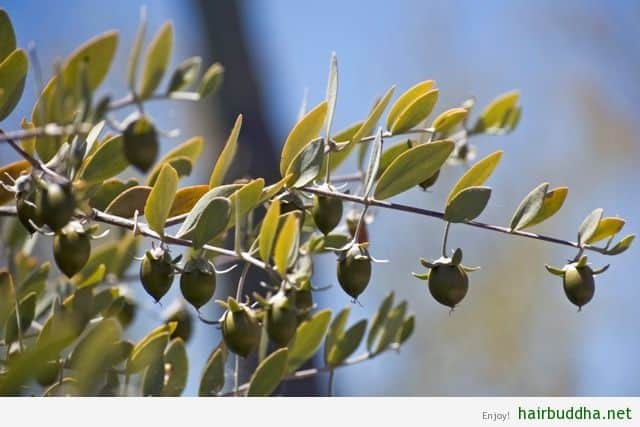 Jojoba seeds were used in folk medicine to treat sores, cuts, scratches, and various other ailments. The native Americans and Mexicans also used them as a hair restorer and conditioner. Modern research does support the anti-inflammatory and anti-bacterial benefits of jojoba oil. So if the hair loss is due to inflammatory issues of the scalp, then jojoba oil can be very useful. 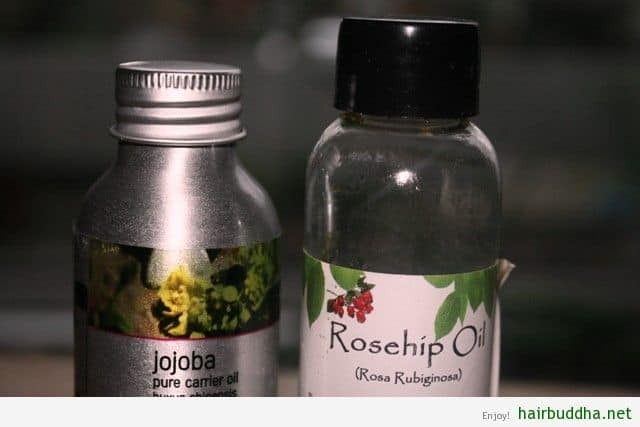 There is an interest in using jojoba oil for hair loss and alopecia. Because jojoba can penetrate the scalp and unclog the follicles, many people believe that it can help produce new hair. 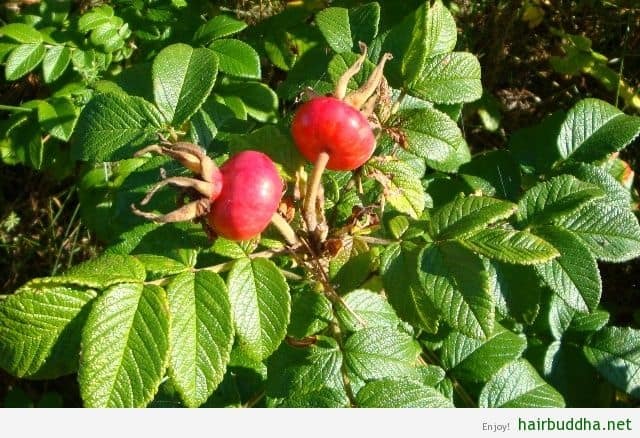 Rosehip oil or rose seeds oil comes from the hip of the rose plant. What is the hip? It’s the berry like part that’s left behind after the flower blooms and where the seeds reside. Like jojoba, rosehip oil also is a dry feeling or non-greasy oil. It is well absorbed by our scalp skin, helping to keep it moisturised and soft. This lovely oil is an excellent source of essential fatty acids that aid in repair and renewal of damaged hair follicles and scalp tissue to promote healthy hair growth. The fatty acids also help soothe irritated scalp conditions like dandruff, increase hair elasticity while adding shine and luster. Rosehip oil also contains beta-carotene (the precursor of vitamin A), which works to normalise oil production and is useful for both oily and dry hair. With some great antioxidants and free radical scavengers, rosehip oil can help battle against oxidants (free radicals) that damage your skin and hair cells. Studies show that hair follicles in particular generate a high level of free radicals – they are generated as a by-product of body’s natural metabolism as well as a product of environmental stress, second-hand smoke and pollution. So you cannot stop the production of free radicals (cause aging, hair loss), but you can surely fight it with the antioxidative power of rosehip oil. Mix the oils in a bowl. How to use: Apply the mixture a little at a time to different parts of your scalp, parting your hair as needed. Massage lightly using the pads of your fingers for about 3 to 4 minutes. Be gentle, yet through. And remember to massage your scalp, not on top of your hair. 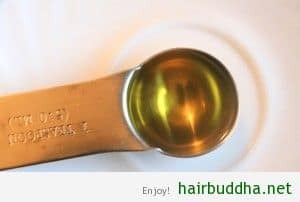 Work same oil along the length of your hair. Leave for at least an hour or overnight if possible (I would say leave overnight). Wash with a natural shampoo. Note: If you are making large amounts, store in a glass bottle in a dark, cool place. 1. Wash your hair no more than two or three times a week. Every time you wash your hair it causes micro trauma and in long run it can become irreversible. 2. Avoid very hot water as it further dry out your hair and cause damage to your hair follicles. Use lukewarm water. 3. Finger nail rubbing: This is acupressure therapy for your hair. You got to try this to believe it. 4. Eat Flax seeds: High in omega 3 and other vital nutrients, flax seeds are literally food for your hair. 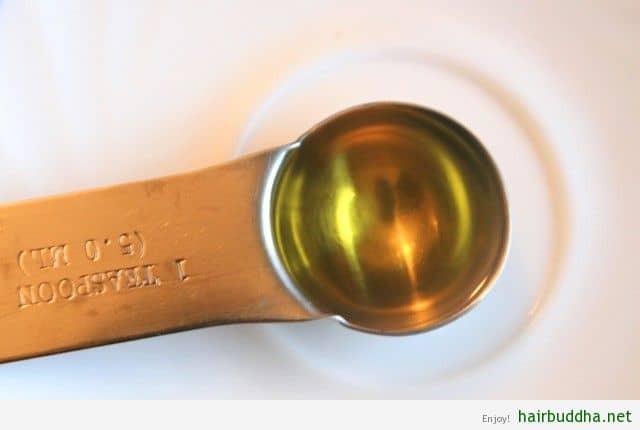 Eat couple of teaspoons daily. 5. Shoulder stand: This yoga pose will increase blood to your scalp and it also has a balancing effect on your hormones. Note: Always learn yoga under supervision of certified yoga teacher. Overnight Facial Serum: This potion is packed with vitamins, antioxidants and essential fatty acids that work on cellular level to rejuvenate your skin. It can correct dark spots, plump out fine lines, and soften your skin. Use at night-time to wake up glowing. You only need a couple of drops each time you use it. Eye Serum: Rich in antioxidants, tannins and carotenoids, jojoba and rosehip oil can greatly reduce dark circles under the eyes. It can also help diminish crow’s-feet and wrinkles around the eye area. Leave-in Conditioner: Light and non-greasy, this blend makes an excellent leave-in conditioner. You can add it to damp hair or even to your dry hair to make them look glossy and smooth. Where to buy: You can usually find these oils at health food stores or you can also purchase them online. Always buy cold pressed oils as they are not altered by heat and retain maximum nutrients. Have you tried this combination on your scalp? or like me are you already a fan of jojoba oil and rose hip oil? Cosmetics and Toiletries November 112, 11, (1997) pp. Ethnobotanical use of plants. Part 4. American Indian Plants. First, if I were to make a larger quantity and store it, how long do you expect it would last? Also, is it possible to use less ingredients (for example, just the rosehip and jojoba oils) and still get a good result? The reason I ask is because my husband and I are traveling by bicycle and then we will be living in China, therefore the less we carry, the better and also it is difficult to get many ingredients (especially ones of good quality) in the area we will be living. I haven’t had a chance to try any of your hair care tips yet but I really like what I’ve been reading so far. When I lived in China in the past, it was an area of highly polluted air (the region we will go to next is great air quality) and I developed some concerns over the impact it has had on my overall health, hair included. So now I am trying to do some repair but also transition to natural techniques, hopefully entirely one day but starting little by little as I can….which prompts another question: What is your insight on Lush cosmetic products, particularly the shampoos and conditioners? I really look forward to trying some of these techniques. Thank you for all your extensive research and especially for helping us take the best possible care of one of the things we pride the most! Hello, I am happy to help. Yes you can use just jojoba and rosehip oil. Before making a large quantity, I suggest you try two or three different combination and see what works best for you. Experiment adding olive oil and lavender oil and see if it makes any difference to your hair. I don’t mind lush shampoos, even though they have SLS. I like their juicy shampoo. I try and avoid using it directly on my scalp, and just use on length to remove the oil. And then I use a herbal tea to condition. Wonderful I look forward to experimenting 😀 Many thanks to you! Are you taking amla in your diet? If not I highly recommend that you do. The more stressed you are, the the more hair you will lose. I have been through it and I know how terrible the feeling is. Do at least 5 to 10 minutes of meditation every day. Early morning is the best. For head massage, use green tea or licorice tea as suggested here. You can add some jojoba oil or this scalp elixir to it. Massage very gently and while massaging recite some hair affirmations (see the post). And of course healthy diet is very important. Include lot of vegetables and fruits in your diet. Also include sesame seeds, rasins, dates, live yoghurt, beans and lentils. And keep me posted on your progress. Thank you so much for your response! I do take Amla,but was not doing it regularly. I will try doing it every day now. I love washing hair with Amla, it definitely gives more volume and shine. I did not try the green tea yet, just nettle and mint tea, but will do it too.! Thank you for taking the time to share all of that great information with me and your support. It meant a lot to me.